Almost 100% of the Big Men who wear large size 13+ footwear have wide feet. It continues to baffle me how the manufacturers of big sizes seem to not be aware of this. Thorogood however, has read the writing on the wall, and they did something about it. 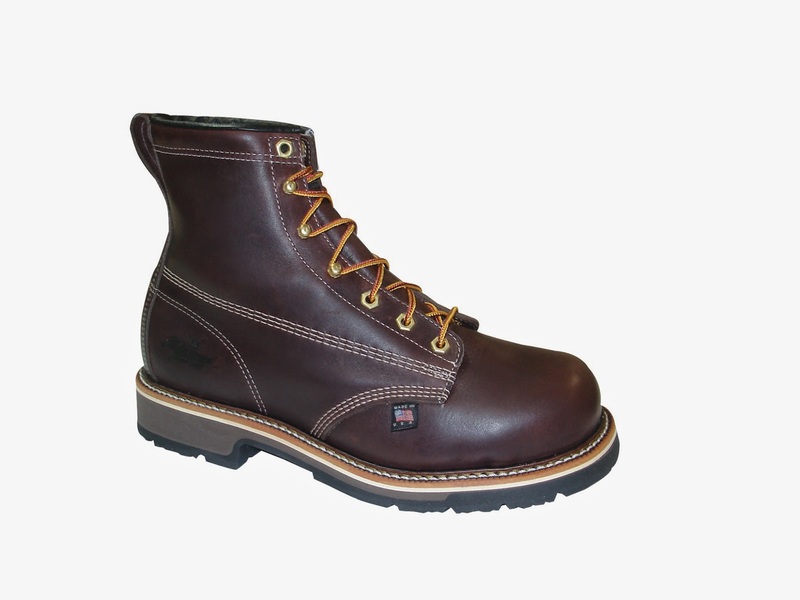 Just today, the first of the new Thorogoood 6" Plain Toe Work Boots arrived at XLfeet. To date they are the only US Made Composite Toe Work boots made to EEEE Wide out there. It's common knowledge that there are a variety of comp toe boots made either to EEEE or H, and there are also companies who make that width in factories here in the United States. What distinguishes this new addition though, is the domestic production of composite toe in the 4E Width. The extra room in the toe box rivals a ballroom for your toes. The USA factor of this boot makes the 4E legit, and your feet will finally feel freedom. If you have have hammer toe, no problem. Wide toes? No Problem. The height on the toe box is nearly 2". They feature welt construction which means they can be re-soled, and are made to last. They are Electrical Hazard rated and Slip Resistant as are the vast majority of Thorogood Boots, and are equipped with the dual-density polyrethane comfort sole with 90 degree heel. If you happen to have a supervisor who stays on you about a defined 90 degree heel, these wide work boots for men will pass with flying colors. With their 6" height on your ankle, they are high enough to deliver support, while giving your calf the freedom it desires. So many guys would find such a boot to be too simple and ordinary and wonder what all the fuss is about. We the men with wide feet however know that a work boot like this is a rarity. It makes it so much easier to live up to our motto with a boot like this. Fitting Extra Large Feet is no Extra Large Feat®. Copyright © 2017 Magento, Inc. All rights reserved.XLFEET, the XL FEET logo, XLFEET.COM, and FITTING EXTRA LARGE FEET IS NO EXTRA LARGE FEET are trademarks of XLFeet Inc. All content on this website is proprietary, copyrighted, and owned or licensed by XLFeet Inc. Any unauthorized use of trademarks or copyrighted content on this website is strictly prohibited. All rights reserved.